You are here: Home > We Are One: Love Cape Town & WIN! We Are One: Love Cape Town & WIN! 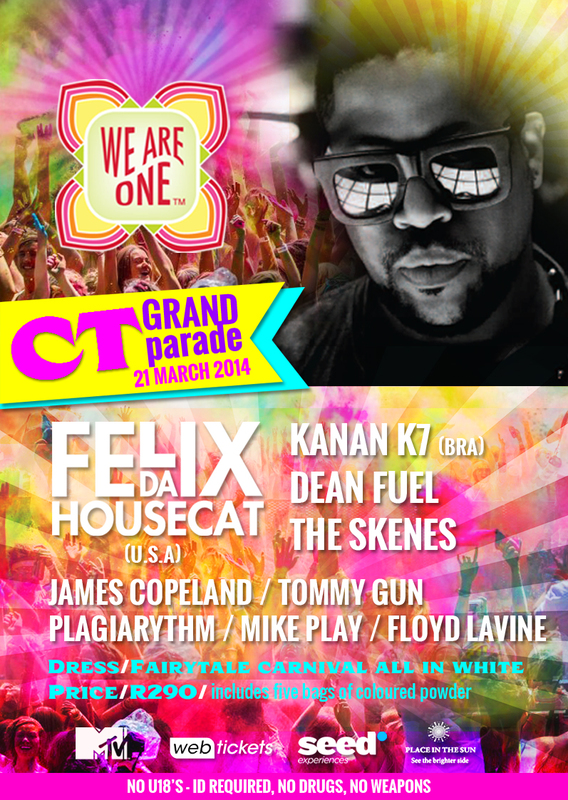 WE ARE ONE the original colour festival is back next weekend and it’s taking place at the Grand Parade in Cape Town CBD. If you have been conned into all the other events using the colour festival idea, then you might as well join me at the real deal to see how it is meant to go down! Here are some of the acts you will be seeing LIVE come 21 March, 2014! My buddies in high places over at the City Of Cape Town Government have given me DBL tickets to give-away to a lucky reader. In return all you have to do is help OUR beautiful city win the WWF We Love Cities competition! Here’s how you can help support your city, get us to the top of the charts and WIN tickets to WE ARE ONE while you’re at it. WE ARE ONE One Cape Town takes place on Saturday, March 21 and you can win double tickets including bags of colour to this amazing, colourful event! 2. Use Twitter and Instagram to prove you Love Cape Town – you must include #WeLoveCapeTown in your posts to qualify. Make sure you tag both @WeLoveCT and @MrCPT in your Tweets too! *Judges will consider both quality and volume, so the more good posts, the better. The winner of the double tickets will be announced after 12pm on Thursday, 20 March! Cape Town is a finalist in WWF’s We Love Cities competition and every time #WeLoveCapeTown is mentioned on Twitter or Instagram, the Mother City gets one vote closer. You can also vote online daily: http://www.welovecities.org/capetown/.